In my last post I started to tell the story of Jake Katz, the oldest child of Meier Katz and Sprinzchen Jungheim. Jake was my grandmother’s second cousin. He came to the US as a teenager in 1887 and within ten years had established his own clothing store in Stillwater, Oklahoma. 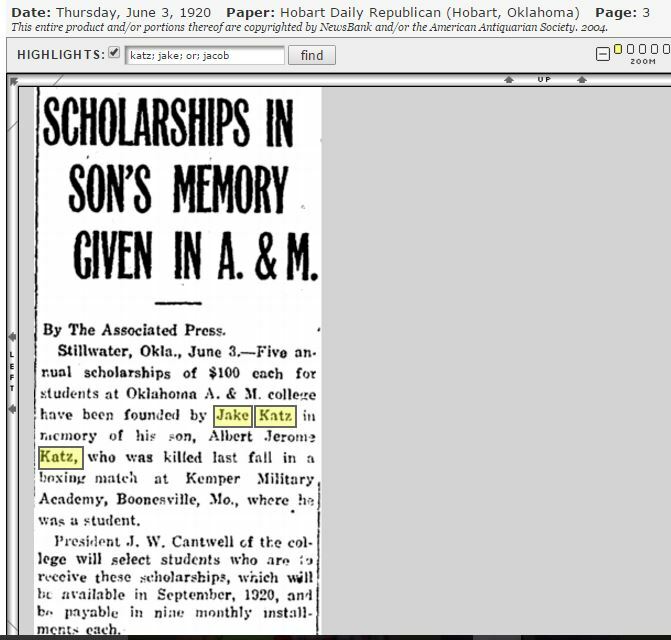 Working with his younger brother Ike and other members of the extended Katz family, Jake helped to establish a chain of clothing stores in a number of places in Oklahoma by 1910. He married Sophia Salzenstein in 1901, and they had three children: Albert Jerome, Helen, and Margaret. All that success, however, was tempered by a terrible tragedy in 1919 when Albert Jerome died during a boxing match at school. The official death certificate for Jerome shows that the authorities concluded that the cause of death was acute dilatation of the heart, defined by the Mayo Clinic as “a disease of the heart muscle, usually starting in your heart’s main pumping chamber (left ventricle). The ventricle stretches and thins (dilates) and can’t pump blood as well as a healthy heart can.” The American Heart Association asserts that one third of those with the condition inherited it from their parents. Disease and other causes are also listed, but physical impact from a fight is not among the listed causes. Ancestry.com. 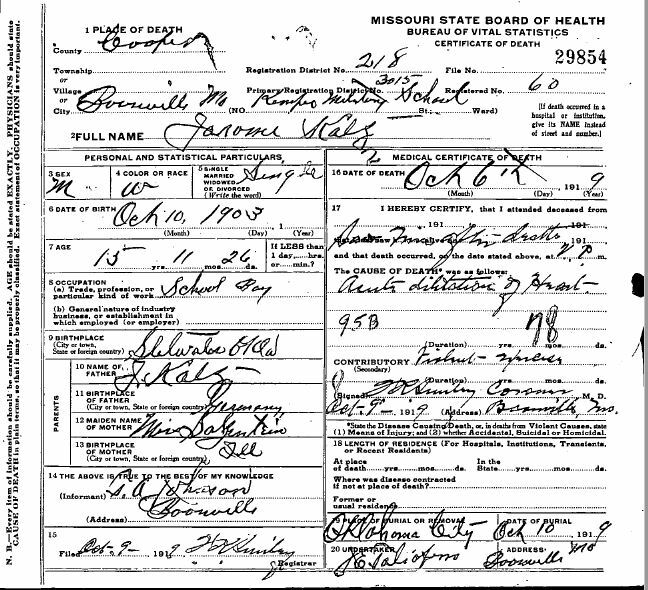 Web: Missouri, Death Certificates, 1910-1962 [database on-line]. Provo, UT, USA: Ancestry.com Operations, Inc., 2015. 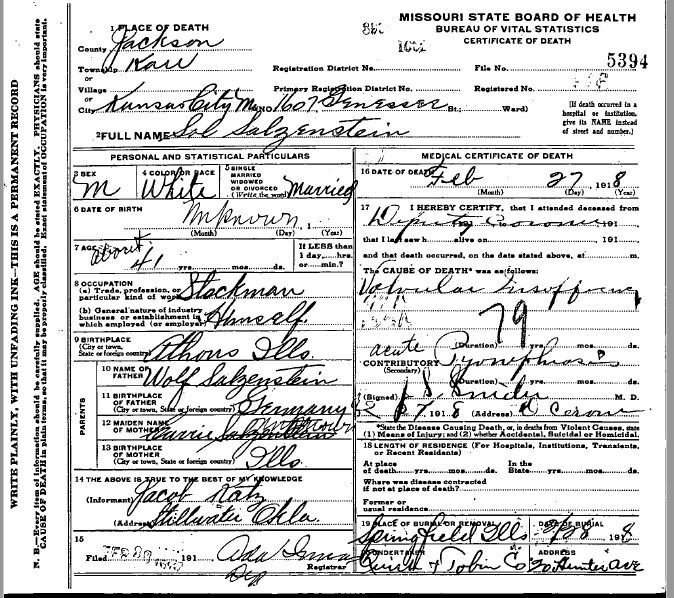 Original data: Missouri Death Certificates. Missouri Secretary of State. http://www.sos.mo.gov/records/archives/archivesdb/deathcertificates/: accessed 24 August 2014. The death certificate for Albert, however, also reported that a contributing cause of his death was “fisticuff exercise,” or at least that’s what I think that says. I couldn’t agree more. It’s hard to imagine something like this being not only allowed, but encouraged by any school today. At least I hope that’s the case. Even if Albert Jerome’s death was caused by heart disease, the idea that a school would condone the use of force to settle a name-calling dispute is very disturbing and obviously was extremely upsetting to the family of this young man. A year after Albert’s death, Jake, Sophia, and their two daughters were living in Stillwater with Sophia’s mother Carrie and her sister Fannie. I find it interesting how the paper described Albert Jerome’s death—that he was killed in a boxing match, not simply that he died during a boxing match. Around this time Jake made Sol Frisch a partner in the Stillwater store; Sol was the husband of Jake’s cousin Florence Katz, daughter of Abraham Katz. Encyclopedia of Southern Jewish Life. Ike Katz, meanwhile, was still living in Pawnee in 1920 with his wife Sophia and running the Katz store in that town. 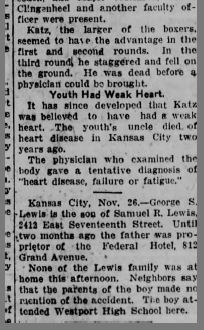 A second tragedy struck the family when Ike Katz died in 1923; he was only 46. According to the family, he left most of his estate to his brother Jake, who used it to acquire land and to expand the family business. Ike’s widow Sophia remarried by 1930 and remained in Pawnee with her second husband, Albert Cohn. Jake’s daughter Helen married Alfred Goldman on February 26, 1930. Alfred was an Oklahoma native, born in 1894 to Michael Goldman, an immigrant from Lithuania, and Hortense Dreyfus, who was born in France. After they married, Alfred and Helen settled in Oklahoma City, where Alfred and his brother Sylvan were in the grocery business. A year later Sylvan would marry Helen’s sister Margaret. Ancestry.com. 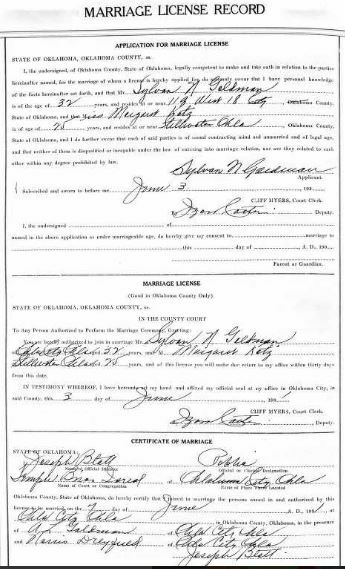 Oklahoma, County Marriages, 1890-1995 [database on-line]. Lehi, UT, USA: Ancestry.com Operations, Inc., 2016. Jake and his daughters suffered another terrible loss when Sophie Salzenstein Katz died on October 17, 1930. She was 58 years old. Meanwhile, the Katz family back in Jesberg, Germany was facing its own crisis with the rise of Hitler and Nazism during the 1930s. Jake would play an important role in rescuing the family back home in Jesberg. 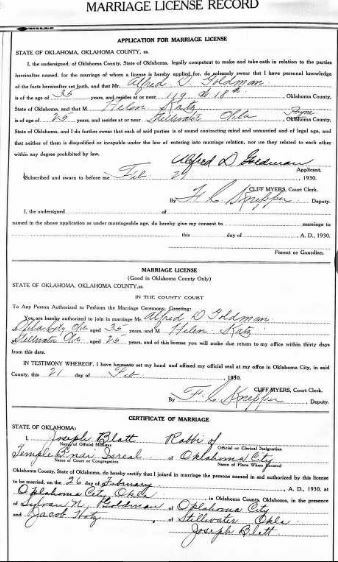 This entry was posted in Genealogy, Katzenstein, Oklahoma and tagged Boxing, Ike Katz, Jake Katz, Katz, katzenstein, Oklahoma, Stillwater by Amy. Bookmark the permalink. Yes, to say the least. You are getting closer to my family connection with your family! I am waiting. It’s coming! I am actually working today on a post that includes an oral history done by Walter in 2000. It won’t be published for several weeks, but stay tuned! What a tragedy to die so young under such circumstances. I guess if it happened when I was in school, I was oblivious. I mean—kids had fights, but not arranged and condoned and supervised and witnessed by faculty members. Oh man, that is awful. If he had died from that heart problem that some young males die from during sports (initials start with M is all I remember), it might be more plausible, but it doesn’t sound like that. and the previous bruises sound very odd. I hope he wasn’t facing bullying that he was trying to handle himself and that there were more people than his opponent (and the silent institution backing it all) involved. I think it’s Marfan syndrome that you’re thinking of. I hadn’t thought about other abuse. 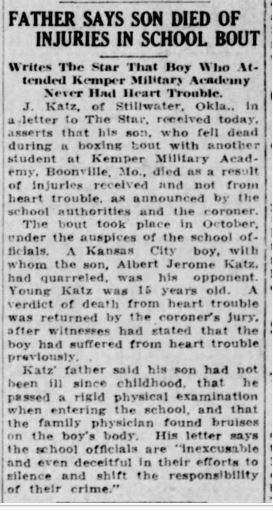 My own hunch is that there was an underlying heart issue as the coroner concluded, but perhaps the stress of the boxing triggered his death. Not Marfan. It’s hypertrophic cardiomyoppathy. HCM. That was the M haha. My late cat had the disease, and it’s one that is involved in many cases when young human male athletes die suddenly in the middle of their sport. I should probably ask my brother his opinion, huh? I was on the wrestling team in high school and college. However I never cared much for boxing. I just did not want to get my nose broke. It is very clear that the boxing match should have been stopped well before the 3rd round. Seems to me a lack of proper supervision. I am surprised that the family did not try to sue. Sounds like they had a good case. Although I am not a boxing fan, I do understand it as a sport among men with supervision and training. But that’s as a sport—not as a fight to settle a name-calling dispute between two teenage boys who were angry with each other. I could not agree with you more. Sadly This was and for some people still a way to settle silly disputes. Yes this still happens as I have seen it in my few years walking this earth. Yes, it sure does. Some of it is unfortunately inherent in human nature. But as civilized people, should be by now be able to resolve disputes without harming or killing each other? So very sad. I went to the Missouri Digital Heritage (I’ve used it often and it is my second favorite site for death records after WVCulture) to zoom in on the pdf. I agree with “exercise” but it doesn’t look like enough letters to get “fisticuff” out of the first word. Good for his parents for establishing the scholarship and NOT for the school where the tragedy happened. I agree—the first word is hard to read. But “fisticuff” seems to fit and would make sense. Thanks for checking! Jake and Sophia’s only son:( My father told me Albert was a victim of hazing. He was a handsome young man. Cousin Jerome had a photo of him. I will try to locate it. Thank you for your work in preserving family history. I would love to see a photo. Actually, I’d love to see any photos of the family. Thanks, Meghan! Oh Amy! This is so terrible. I can’t imagine having a child die in this way. I think it would be nearly impossible to forgive the school officials. It sounds like Jake was able to move on from the tragedy though. I’m so interested to hear about his efforts to rescue his family from Germany! I’m guessing that is up next? The death of any child is unimaginable, but to be a victim of bullying and then beaten up by the bully while the school watched? Just awful. And yes—Jake did go on to help rescue many of his relatives back in Germany! I’m looking forward to reading about it! Thanks, Amberly. Have a good weekend! Oh, Amy, this post just kept getting more sad and more sad. To lose a child and then have to deal with school policies and rules and a total lack of regard for the family. Inexcusable to say the least. Seems as though these two boys should not have been allowed to fight in the first place. How tragic. I agree. The whole thing is tragically stupid. I really feel the despair the parents felt in your writings. Good job sharing what happened, how, and the injustice. Thank you, Karen. When I read and then write about these people, I try to imagine being in their shoes. It helps me see them as people, not just names and dates. Yep, that’s what got me started. Realizing that my grandson might not even know my parents (although he’s now seven and they’re still alive, so he knows them well as does his three year old brother). Amy, The news coverage adds to the immediacy I felt when reading about Albert Jerome’s death. It is a very sad indication of affairs when the kind of bullying that existed at the time of Albert’s death is still in existence today. I’m reminded of when I went to school, the fights after school took place away from the school. I never witnessed one but the verbal abuse and threats went on during school hours. Nothing was ever done to deal with the matter that threats and abusive speech should be considered a matter for the Dean. What I found disturbing is that the Academy where Albert went permitted the match to take place as a way to resolve a dispute. And today hazing takes place on campus. If no one is hurt or dies it continues as a part of what some consider a tradition. It is sad that this kind of bullying still goes on. And in fact social media has made it worse. Yes, Amy, very good point. It is really unsocial media. After the collapse of our family business I was state educated, but in my early years I attended a private school. The practice of boxing to settle disputes was in being at that relatively recent time (about 1955, I think). It was conducted under supervision with gloves and Marquis of Queensbury rules, but it was boxing nonetheless: I would have been about eight or nine years old. I wonder if your school would do this today. I wonder if any school does. Unlikely, I would think. The State system certainly wouldn’t countenance it – much too civilized! How horrible that this was allowed. Can you imagine something like this happening today? I can’t. But some of the comments make it clear that this was not uncommon at one time. Seems awful to me. Can you envisage something like this happening today? I wonderment if your schooltime would do this today. No, I cannot. But there may be schools where they still allow this—just not any that I know about.